These easy Cream Puffs are made from scratch, and taste SO delicious freshly baked from the oven. A simple choux pastry dough is mixed together, then baked and filled with a vanilla pastry cream! 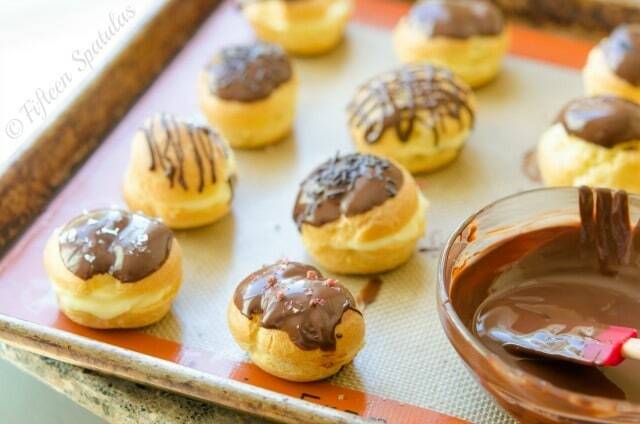 When it comes to cream puffs and eclairs, freshness is everything. I can’t tell you how many times I’ve bought cream puffs from a bakery, disappointed to find a stale and cardboard-like exterior, instead of the light and fluffy choux pastry that I know cream puffs should have. Which is why they’re so wonderful to make at home! Cream puffs are a very simple dessert, but it’s their elegance that makes them so perfect. I remember the very first time I tried a cream puff, my stepdad was enjoying his day off work by watching some Sunday football, with a big tub of frozen cream puffs in his lap. Side note: Is Sunday football + a big tub of cream puffs the “man equivalent” of a ladies night chick flick + a pint of ice cream? Quite possibly. He held the bucket of golden puffballs in front of me and after tasting one, I instantly understood why he had the whole bucket out. Creamy and luscious vanilla pastry cream encased with a light and golden dough…it’s perfect. A true, classic cream puff is choux pastry filled with straight-up whipped cream, but I like making a pastry cream with whipped cream folded in to lighten it, kind of a hybrid between the two. It’s a little sturdier and more substantial than plain whipped cream, and I think it tastes the best! In the recipe box below I’ve included my recipe for my favorite filling, this cream-lightened vanilla pastry cream, but feel free to fill with whatever you’d like. I have a deliciously silky chocolate pastry cream recipe on my site too that I love. And I think dipping the tops into chocolate is wonderful too. Bake in a 400F oven for about 25 minutes, until golden brown. Then once they are baked, let them cool completely. I use the cooling time to make the pastry cream. If you have the right tip you can pipe the filling into the puffs without cutting them open, but you can also just slice them in half and fill. Honestly I like the look of it better since you can see the filling peeking out. As far as toppings go, I just dipped them with a little melted bittersweet chocolate, and added sprinkles, fleur de sel, and so on. I think they look fun with a little decoration, but you can definitely skip it too. 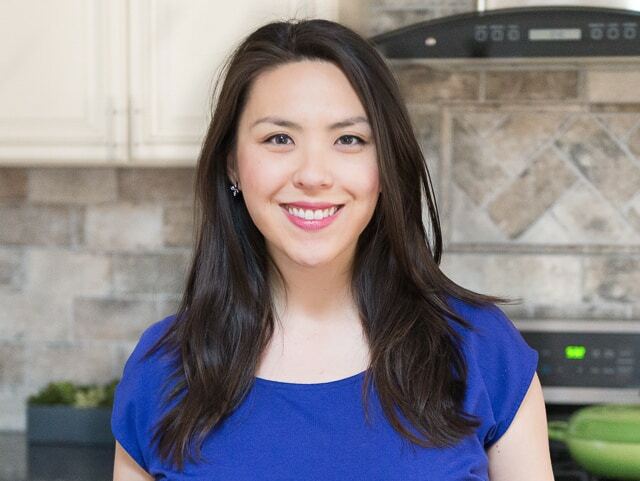 For more of my favorite dessert recipes, I love Tiramisu, Caramel Apple Crisp, and Brown Butter Blondies. 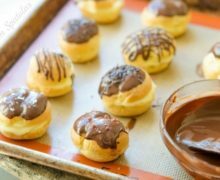 How to Make Profiteroles: You can also fill these cream puffs with small scoops of ice cream instead of the pastry cream, which would technically make them profiteroles. That’s delicious too, and just a different experience. Can Cream Puffs be made ahead of time? Technically yes, but I don’t like doing that because they taste much better fresh. A compromise would be to make the vanilla pastry cream a day or two in advance, so you can have that ready to go when the cream puffs bake. Can Cream Puffs be frozen? Yes, in an airtight container for up to a month, but they won’t taste as good as fresh. 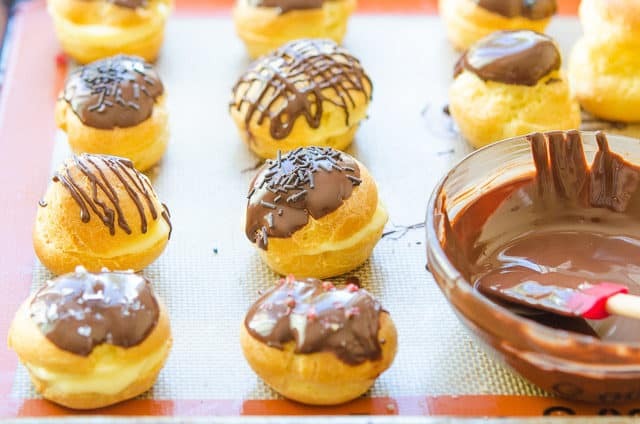 When to Fill Cream Puffs: You want to fill them as soon as they’ve cooled, so that they won’t melt the filling, but they still taste fresh from the oven and aren’t stale. 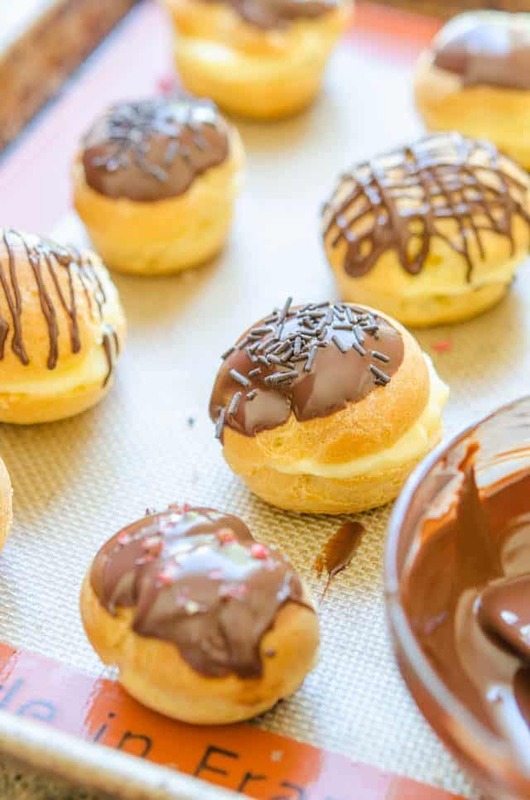 How to Store Cream Puffs: You can refrigerate these for a day or two, or freeze for up to 1 month, but know that once you refrigerate or freeze the dough, it won’t taste as good. The dough will be a bit stale. 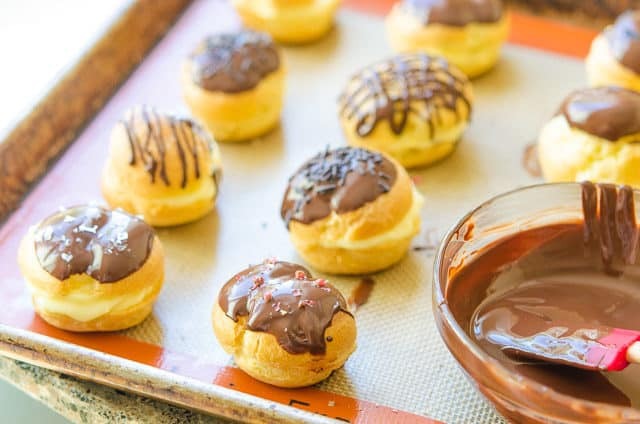 For these homemade Cream Puffs, an easy choux pastry dough is mixed together, then baked and filled with an easy vanilla pastry cream, and finally topped with melted chocolate! 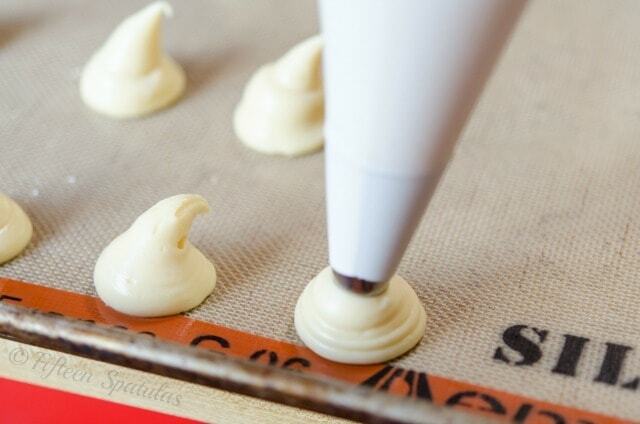 Preheat the oven to 400 degrees F and line two baking sheets with parchment paper or silpats. 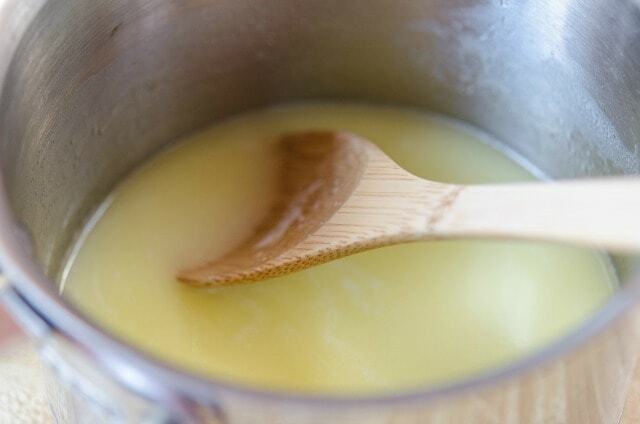 Place the water and butter in a saucepan and melt over medium high heat. Dump the flour and salt in all at once and stir, on the heat, for 2-3 minutes until the mixture is smooth and the dough falls away from the sides of the pan. 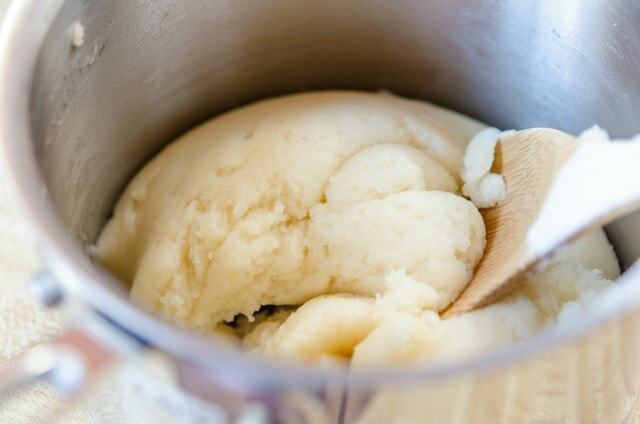 Transfer the dough to a food processor and let it cool for five minutes. Add all the eggs, and pulse the mixture until the dough is smooth and has fully incorporated the eggs. The dough should look like a thick cake batter. 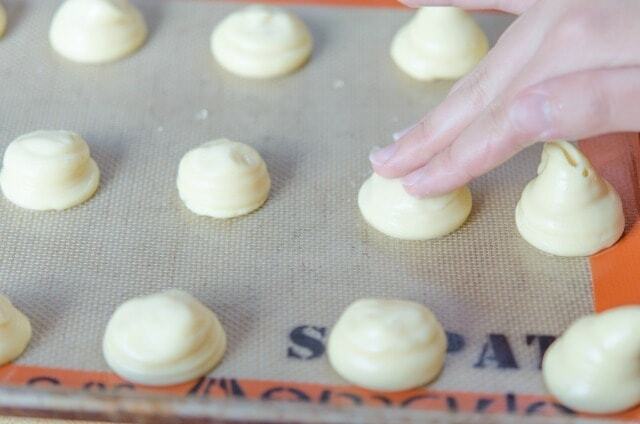 Transfer this choux dough into a piping pag and pipe out small mounds of dough, about an inch in diameter, and about 1/2 inch tall. They will puff up considerably and you don’t want to make them too tall. Bake for about 25 minutes until the puffs are golden brown, then remove them from the oven and use a knife to poke a small hole into each of the puffs. This will let the steam escape and prevent our puffs from getting soggy. Let cool completely. 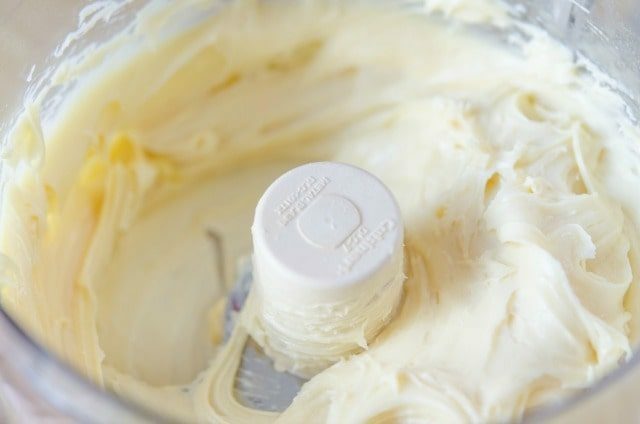 To make the pastry cream, scald the milk in a saucepan over medium high heat (you want to cook the milk to about 180 degrees F, when little bubbles start to form on the side of the pan. This is the stage before a boil). 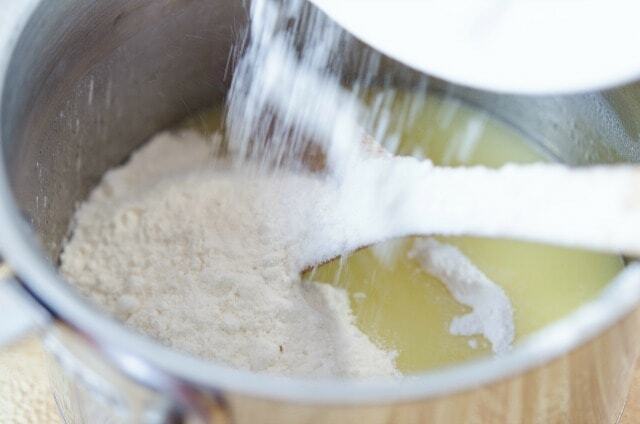 While the milk heats up, whisk to combine 1/2 cup sugar, the egg yolks, and cornstarch. Once the milk has come to the right temperature, slowly dribble the milk into the egg yolk mixture while whisking constantly, then return all of the liquid to the pan. Cook over medium high heat, stirring constantly, for the next minute or two, until the mixture comes to a boil and the mixture thickens up considerably. 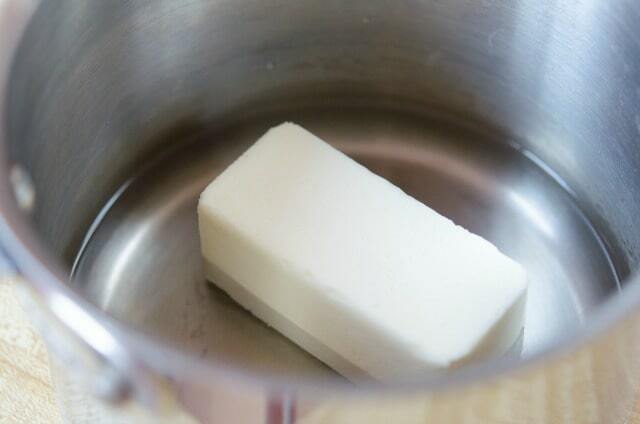 Remove the pastry cream from the heat and stir in the vanilla and a pinch of salt. Taste and adjust vanilla and salt levels if needed. Chill the pastry cream in the fridge while you make the cream. Combine the heavy whipping cream and 2 tbsp sugar in a bowl and whip with either a hand mixer or a whisk until it forms soft peaks. 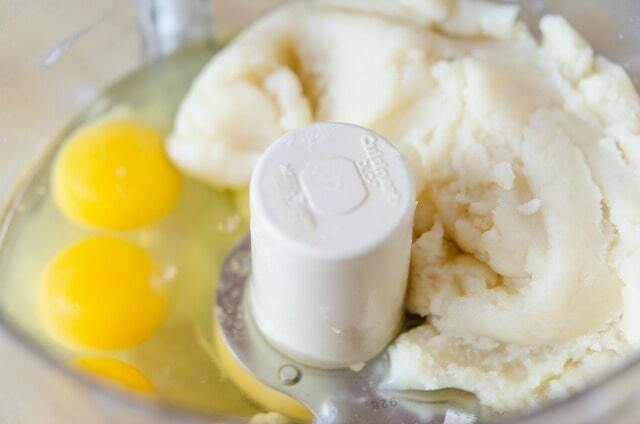 Fold this mixture gently into the pastry cream to lighten it. You can now fill the puffs with this mixture, or you can chill it if you prefer. Enjoy! My dough was perfect until I added the eggs and then it was really runny despite following word for word. Any advise for next time? There are a few possibilities that come to mind for runny dough. First, it’s possible the dough wasn’t cooked long enough (are you using a gas or electric stove? ), and also is it possible that the dough did not cool for long enough before adding the eggs? Were the eggs cold from the fridge? Gas stove. I wasn’t sure if there was such a thing as over-cooking so I took it off the heat as soon as it came away from the sides and made a nice ball. I don’t recall the egg temperature situation but its possible. Should they be the same temp as the batter? And I was wondering if maybe my eggs were too large and that could have been part of the issue?